Neurocutaneous syndromes encompass a group of disorders that affect the embryonic ectodermal plate, which includes the central and peripheral nervous systems, as well as the overlying skin. Mesodermal and endodermal structures may be involved, depending on the type and severity of the specific neurocutaneous syndrome. Common developmental abnormalities include dysplasias and often an increased incidence of neoplasms. 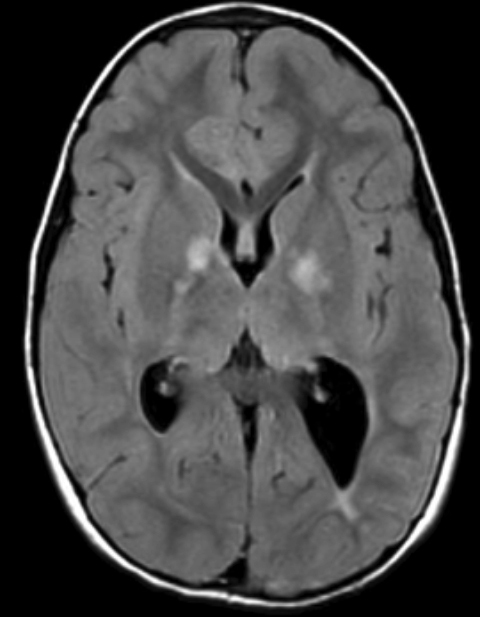 Intracranial CNS manifestations include characteristic NF1 “spots” and low-grade neoplasms. The NF1 “spots” are regions of signal abnormality involving the basal ganglia, thalami, dentate nuclei, cerebellar peduncles, optic radiations, and brainstem in children and adolescents; they are thought to represent regions of myelin vacuolization (Figure 1). They are hyperintense on T2 sequences and typically iso- to mildly hyperintense on T1 images. There should be no mass effect or enhancement, as enhancement or significant mass effect suggests development of a low-grade glioma. The lesions may wax and wane for the first decade of life or so and then regress.8 They are uncommon after the second decade of life. 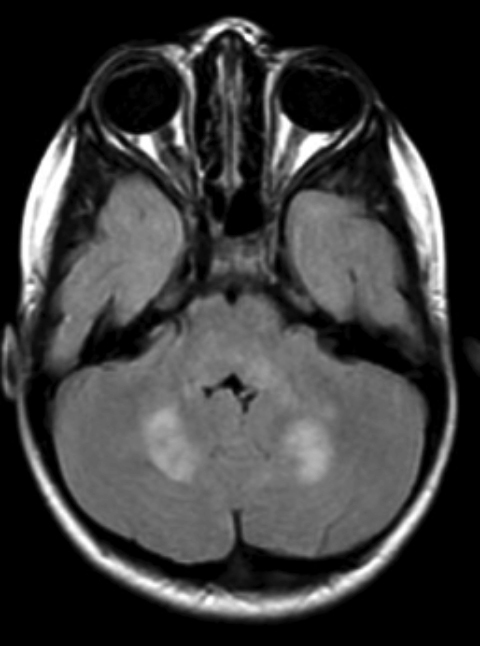 Low-grade cerebellar, brainstem, tectal plate, and basal ganglia gliomas are also common and have an increased incidence in the setting of NF1; the vast majority are pilocytic astrocytomas, although high-grade gliomas may occasionally be seen as well. 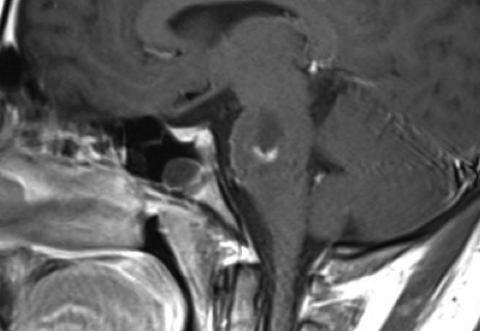 Pilocytic variants involving the posterior fossa, brainstem, and optic pathways commonly present as cystic tumors with an enhancing mural nodule (Figures 4 and 5). 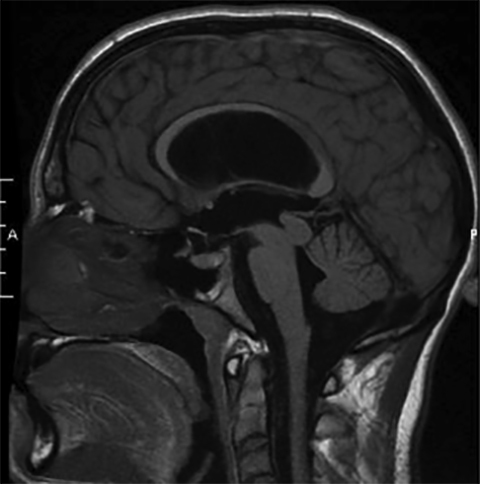 Enhancement may be seen along the cyst wall as well, which often indicates tumor cells lining the cystic component (Figure 5).14 On MRI, tectal plate gliomas are typically T2 hyperintense and iso- to hypointense on T1 with no or minimal enhancement (Figure 6). More aggressive gliomas most often present in the pons and appear as ill-defined, infiltrative masses with variable enhancement patterns. 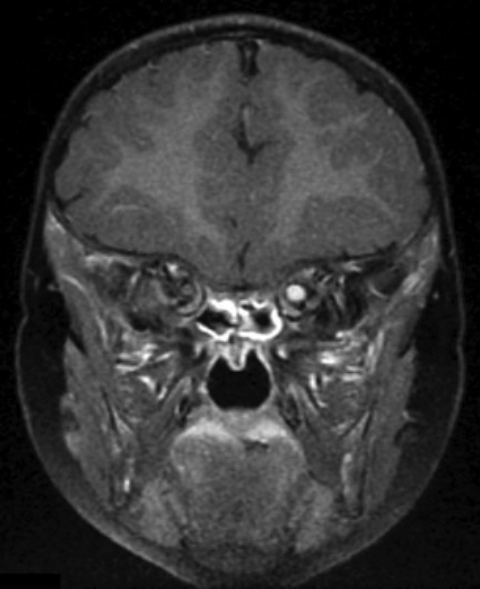 Higher-grade components demonstrate central necrosis with increased peripheral enhancement and perfusion, as well as restricted diffusion.14 Obstructive hydrocephalus may result from mass effect associated with tectal plate, cerebellar, or brainstem gliomas or as a result of aqueductal stenosis, which has an increased incidence in patients with NF1. 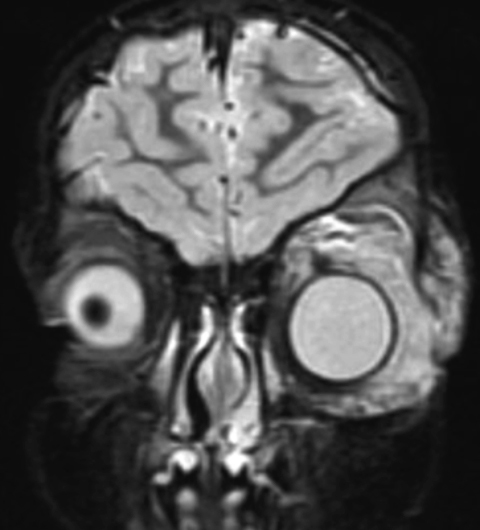 In addition to OPGs (described above), orbital findings include sphenoid wing dysplasia with associated pulsatile exophthalmos, buphthalmos (globe enlargement), and intraorbital extension of a plexiform neurofibroma. 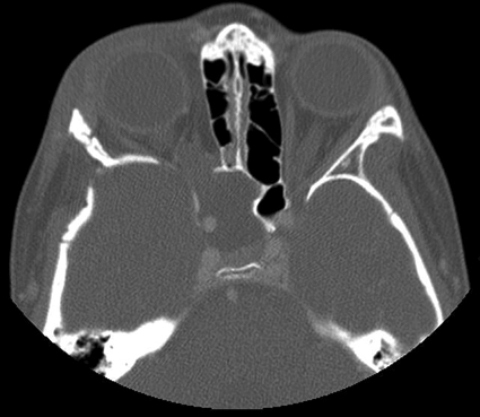 Sphenoid wing dysplasia is a characteristic finding of NF1 but is relatively uncommon. The greater wing of the sphenoid is most often involved. 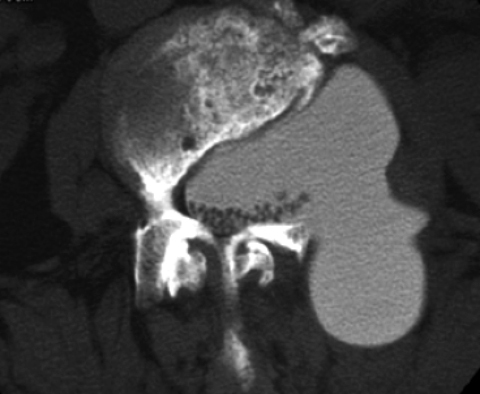 Although the precise etiology of sphenoid wing dysplasia is not entirely understood, recent studies suggest that the process may be multifactorial with a combination of bony dysplasia, as well as an ipsilateral plexiform neurofibroma affecting growth and closure of skull base sutures.15 Cross-sectional imaging demonstrates anterior displacement and thinning of the sphenoid bone with enlargement of the middle cranial fossa in the anteroposterior dimension (Figure 7). 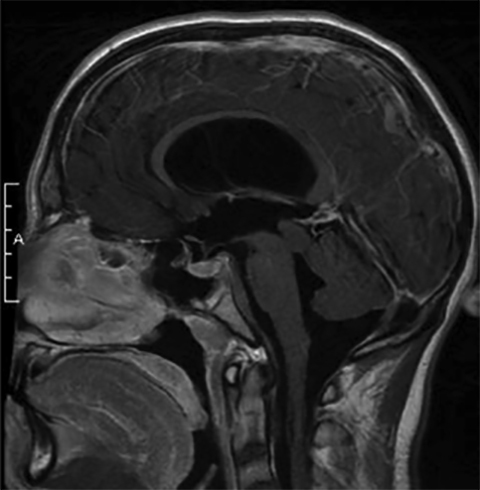 Herniation of portions of the temporal lobe and overlying CSF into the posterior margin of the orbit results in pulsatile exophthalmos. Globe enlargement – buphthalmos – may also be seen in the setting of NF1 (Figure 8). Moya moya is characterized by progressive occlusion of the supraclinoid internal carotid artery and/or proximal cerebral arteries with development and enlargement of multiple basilar collateral vessels. 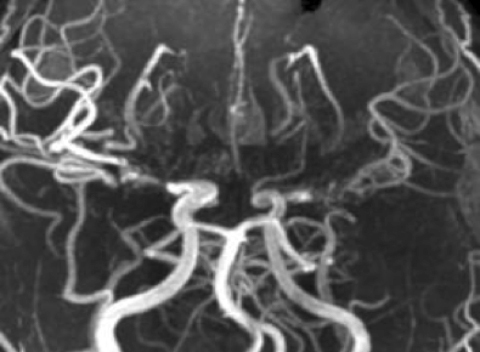 The term “moya moya” means “puff of smoke” in Japanese and corresponds to the appearance of abnormal collateral vessels depicted on angiography when the entity was first described.19 On MR angiography, there is loss of flow signal intensity at the carotid terminus and/or proximal cerebral arteries with multiple enlarged basilar collateral vessels, which have a smudgy appearance (Figure 10). This results in the characteristic “puff of smoke” appearance. Patients are at risk of ischemia and subsequent infarcts, especially in a watershed distribution, as well as hemorrhage. Perfusion imaging can be used to monitor disease progression and determine whether or not there is an adequate vascular reserve. 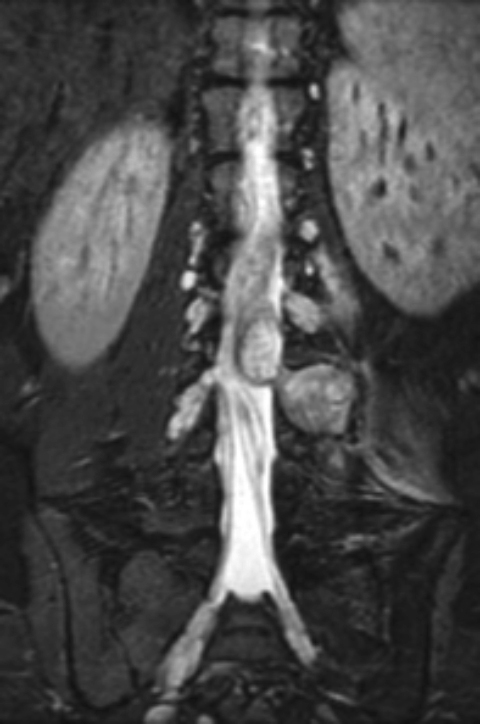 Spinal manifestations of NF1 include multiple bilateral intraspinal and paraspinal neurofibromas. Spinal lesions may be intradural, intradural and extradural, or purely extradural. 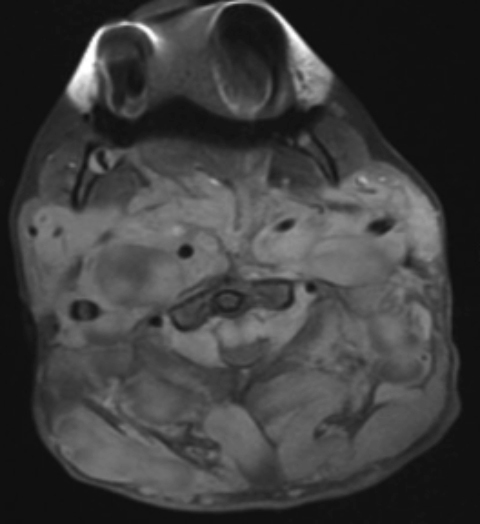 On imaging, smaller lesions are often T2 hyperintense with prominent enhancement, similar to schwannomas. Larger lesions are more heterogeneous in signal intensity and enhancement patterns. 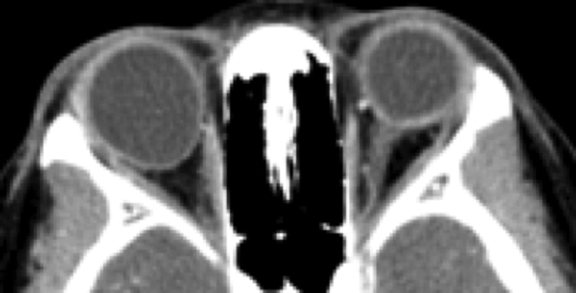 As with NFs elsewhere and as discussed above, neurofibromas are more likely than schwannomas to demonstrate the “target sign,” which refers to peripheral increased and central decreased T2 signal intensity. Intra- and extradural lesions extend through and expand the bony neural foramina with benign bony remodeling (Figure 11). 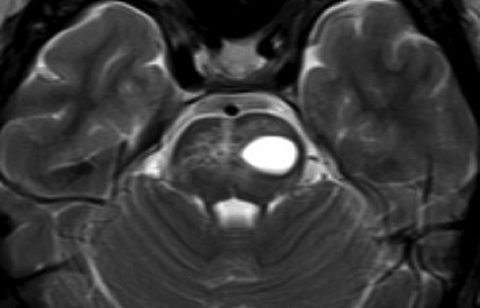 Although the majority of cases of malignant peripheral nerve sheath tumors occur in the setting of neurofibromatosis, the estimated incidence of malignant peripheral nerve sheath tumors in NF1 patients is approximately 5%.20 Malignant lesions tend to be larger, more ill-defined and heterogeneous, and grow fairly rapidly with regions of central necrosis (Figure 12). Large retroperitoneal PNFs may be present and are prone to malignant degeneration, which is best characterized by interval growth on subsequent imaging. Additional spinal manifestations include kyphoscoliosis (Figure 13), dural ectasia with posterior vertebral body scalloping, and lateral thoracic meningoceles. 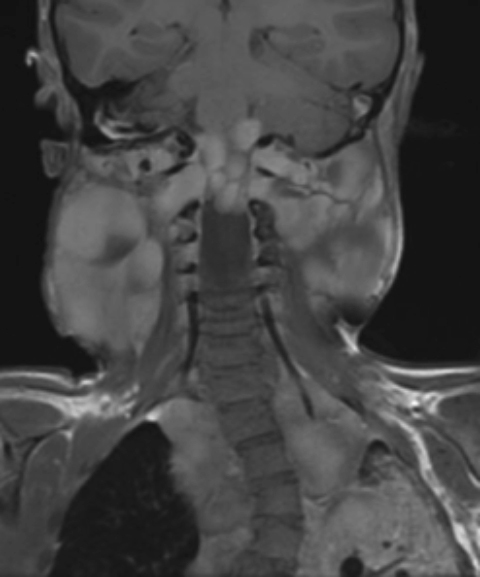 The bony manifestations of NF1 may be due to a primary bony dysplasia and/or bony changes associated with adjacent neurofibromas.21 Lateral thoracic meningoceles are thought to result from dural ectasia/meningeal dysplasia (Figure 14). Extra CNS and spinal manifestation are beyond the scope of this review, but include cutaneous abnormalities, such as cutaneous neurofibromas and café-au-lait spots; pseudoarthroses and bowing deformities affecting the long bones of the extremities; “ribbon” ribs; and overgrowth or hypertrophy of all or a portion of a limb. NF1 is associated with an increased incidence of neoplasia, to include pheochromocytoma, gastrointestinal stromal tumors, leukemia, and lymphoma. Neurofibromatosis type 1 is the most common of the neurocutaneous syndromes, affecting multiple sites and organ systems. CNS manifestations occur in roughly 10%-20% of patients and include regions of myelin vacuolization (NF1 “spots”); multiple tumors, to include gliomas (optic pathway and spinal are the most common) and variants of neurofibromas; bony dysplasia; vascular abnormalities; and dural ectasia. Understanding the characteristic imaging findings, as well as their clinical significance and expected evolution, is critical in correctly interpreting neuroimaging studies in this patient population, and appropriately guiding management decisions. Lammert M, Friedman JM, Kluwe L, et al. Prevalence of neurofibromatosis 1 in German children at elementary school enrollment. Arch Dermatol 2005; 141(1): 71-74. Evans DG, Howard E, Giblin C, et al. Birth incidence and prevalence of tumor-prone syndromes: estimates from a UK family genetic register service. Am J Genet A 2010; 152A(2):327-332. Jett K, Friedman JM. Clinical and genetic aspects of neurofibromatosis 1. Genet Med 2010 12(1):1-11. Tonsgard JH. Clinical manifestations and management of neurofibromatosis type 1. Semin Pedatr Neurol 2006; 13:2-7. Williams VC, Lucas J, Babcock MA, et al. Neurofibromatosis type 1 revisited. Pediatrics 2009; 123:124 -133. Ferner RE, Huson SM, Thomas N, et al. Guidelines for the diagnosis and management of individuals with neurofibromatosis 1 (NF1). J Med Genet 2007; 44: 81-88. Braffman B, Naidich TP. The phakomatoses, part 1: neurofibromatosis and tuberous sclerosis. Neuroimaging Clin North Am 1994; 4:299-324. Sevick R, Barkovich A, Edwards M, et al. 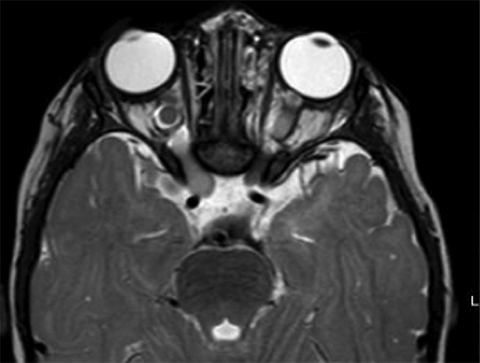 Evolution of white matter lesions in neurofibromatosis type 1: MR findings. Am J Roentgenol 1992; 159:171-175. Kornreich L, Blaser S, Schwarz M, et al. 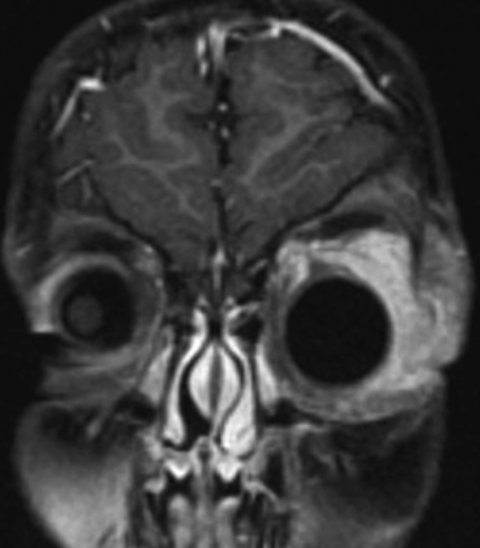 Optic pathway glioma: correlation of imaging findings with the presence of neurofibromatosis. Am J Neuroradiol 2001; 22:1963-1969. Nicolin G, Parkin P, Mabbott D, et al. Natural history and outcome of optic pathway gliomas in children. Pediatr Blood Cancer 2009; 53:1231-1237. Listernick R, Charrow J, Greenwald M, et al. Natural history of optic pathway tumors in children with neurofibromatosis type 1: a longitudinal study. J Pediatr 1994 ;125:63-66. Blazo MA, Lewis RA, Chintagumpala MM, et al. Outcomes of systematic screening for optic pathway tumors in children with neurofibromatosis type 1. Am J Med Genet 2004; 127:224-229. Avery RA, Fisher MJ, Liu GT. Optic pathway gliomas. J Neuro-Ophthalmol 2011; 31:269-278. O’Brien WT. 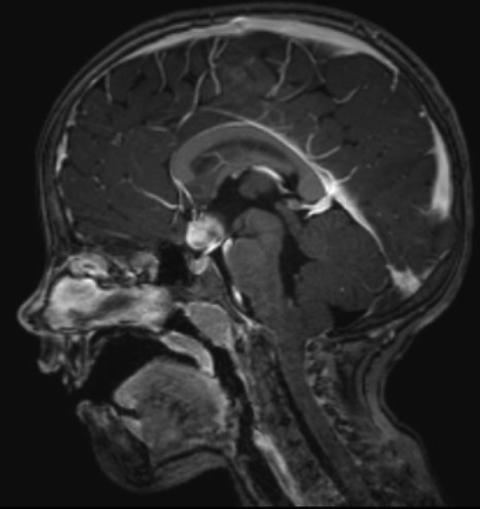 Imaging of primary posterior fossa brain tumors in children. J Am Osteopath Coll Radiol 2013; 2(3):2-12. Jacquemin C, Bosley TM, Liu D, et al. 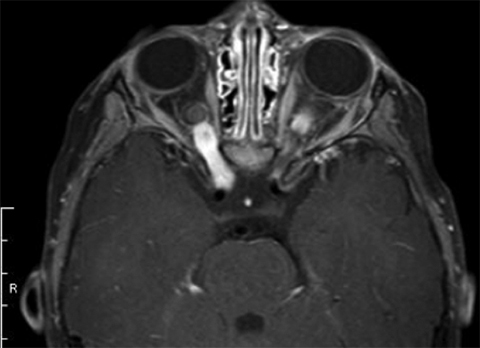 Reassessment of sphenoid dysplasia associated with neurofibromatosis type 1. Am J Neuroradiol 2002; 23:644-648. Carra BJ, Sherman PM. 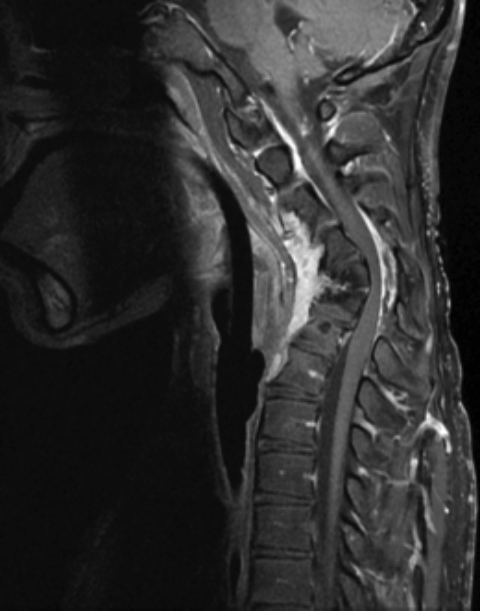 Intradural spinal neoplasms: a case based review. J Am Osteopath Coll Radiol 2013 2(3):13-21. Evans DG, Baser ME, McGaughran J, et al. Malignant peripheral nerve sheath tumours in neurofibromatosis 1. J Med Genet 2002; 39(5):311-314. Rodriguez D, Poussaint TY. Neuroimaging findings in neurofibromatosis type 1 and 2. Neuroimag Clin N Am 2004; 14:149-170. Burke GM, Burke AM, Sherma AK, et al. Moyamoya disease: a summar. Neurosurg Focus 2009; 26(4): 1-10. Lin J, Martel W. Cross-sectional imaging of peripheral nerve sheath tumors: characteristic signs on CT, MR imaging, and sonography. Am J Roentgenol 2001; 176:75-82. Sher BJ, Duncan IC. 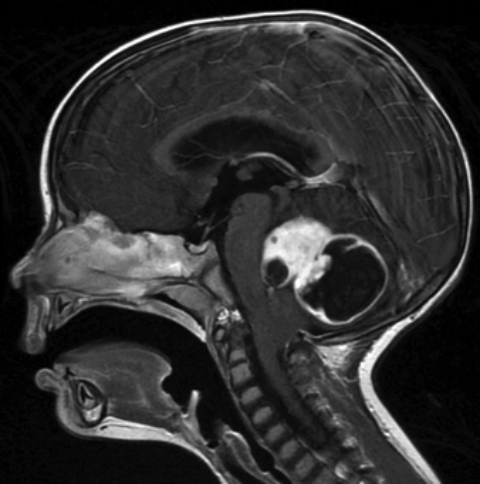 Neurofibromatosis type 1 – some cranial and spinal manifestations. SA J Radiol 2004; 8(3):32-35. 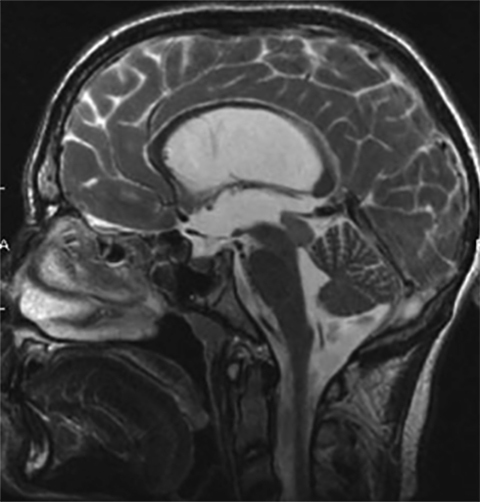 Neuroimaging Manifestations of NF1 — A Pictorial Review. 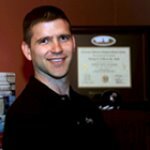 J Am Osteopath Coll Radiol.